I love that sweet image and couldn't wait to make a card with it. I chose to make a scalloped oval easel card. I colored the image with colored pencils and then accented parts of it with Liquid Glass from CTMH .I used some chalk and Sakura Clear Stardust Gelly Roll pen to accent the snow at their feet. I topped it off with a red bow. The sentiment is from the Believe In Christmas stamp set also from CTMH and is stamped on a die cut label from Paper Artist cutting dies "9 Tiny Tags & Little Labels" from HOTP. 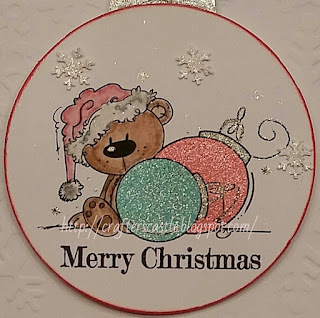 The ovals were made with Sizzix thinlet dies. 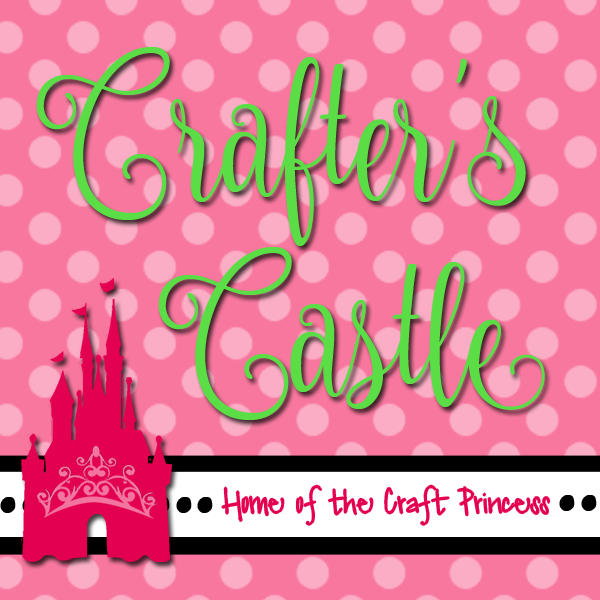 There will be prizes from some awesome sponsors, including Bugaboo Stamps . The card is 4 1/2" x 4 1/2". 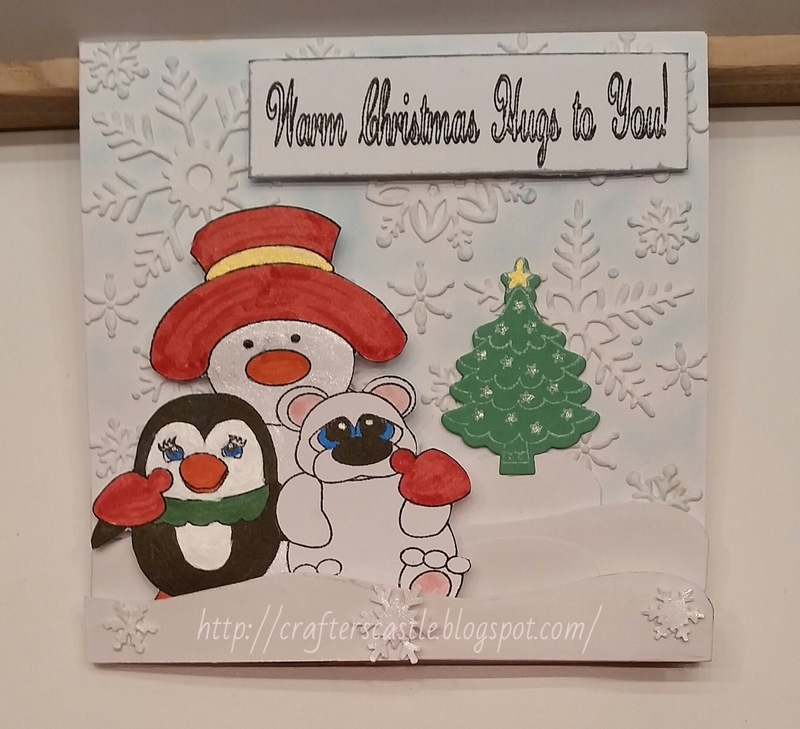 The background was made using a snowflake embossing folder that came with my Cardmaking & Papercraft Magazine ...you can also find them HERE on FB . It was colored blue around the snowflakes with chalk. 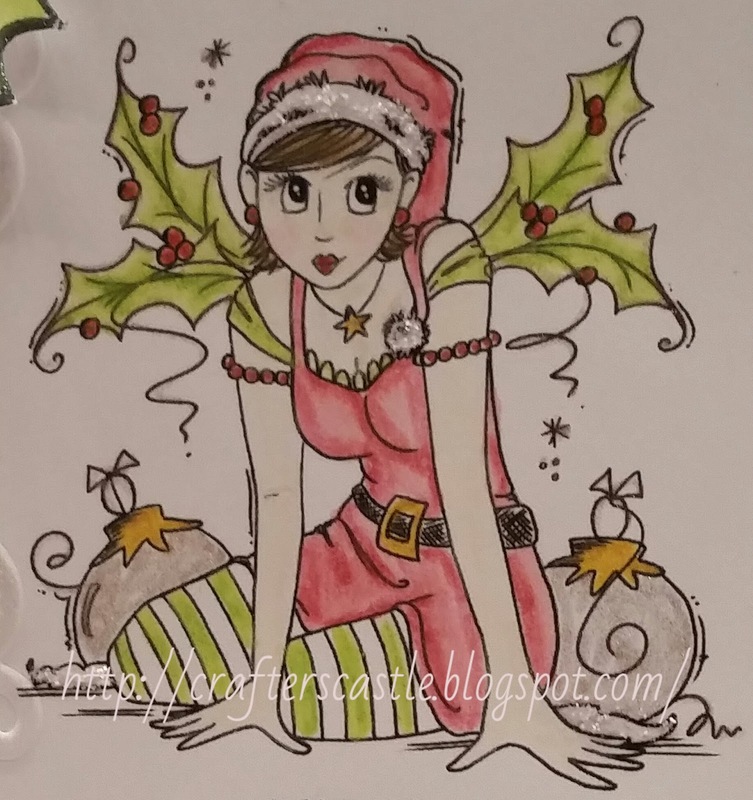 The image was colored with Distress Markers and cut out. The Christmas tree is a stamp and die from Your Next Stamp. 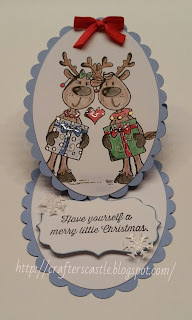 The snow drifts are from the Paper Sweeties Sweet Cuts die set called Thanks Snow Much . Like me, my daughter likes to make things dimensional. She layered several of the snow drifts with 3D Foam Squares and layered the image between the snow drifts. 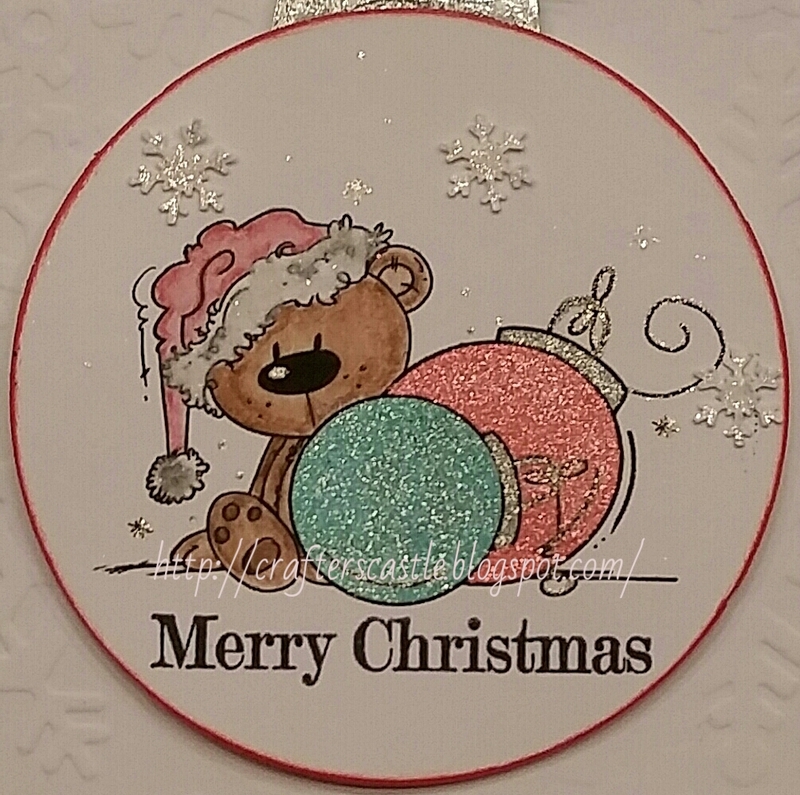 The sentiment "Warm Christmas Hugs To You" is part of the Warm Winter Hugs stamp set. It's a sweet card and I think she did a great job. 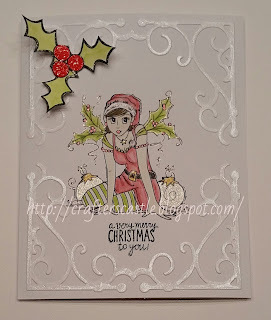 The Happy Holidays stamp is from the "Just To Say" Cricut Collection stamp set from Close To My Heart . I think it all came together BEAUTIFULLY. They have an amazing variety of stamps in both cling and wood. 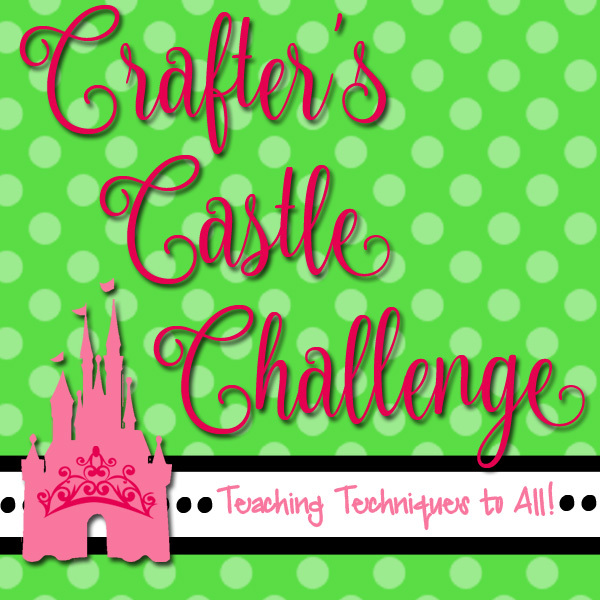 Great Impressions November Challenge - Bling On The Holidays! I know this is hard to believe, but we didn't have a nativity scene and I wanted one to put up for Christmas. I wanted something dimensional and something that would stand up by itself. I stamped the image FOUR TIMES....the fourth one was just so I could get the star and the bushes. I colored each image with watercolor pencils. I left one completely intact for the back layer. The other layers I cut everything out of leaving the manger like a frame. Each image was cut out individually to be used for layering. Mary and Joseph were only layered once, baby Jesus was layered twice. As you can see the manger has two layers on top of the back layer. The extra bushes and star are layered onto the very front. I used foam tape to do the layering for added dimension. Next I cut a 6" circle out of dark blue cardstock. I scored it at 3 3/4" and folded it there to create the stand...the smaller part for the base, the larger part to foam tape the nativity scenc to. I added stars to the "sky" with a Sakura Clear Stardust Gelly Roll pen. 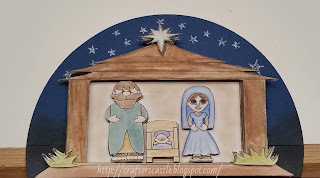 I used the same pen to color the star above the manger. As you can see it stands nicely and is very sweet. This was inspired by "Away In A Manger"
I thought that a rocking horse should be on a rocking card. 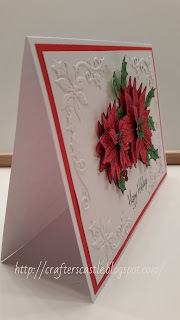 To make the rocking card base I used the largest die (4 1/4") from the Sizzix Scallop Circles. I had a piece of old fashioned looking patterned cardstock that had presents on it, but of course you can use whatever cardstocks you like. I scored the circle at 2 1/8" (the center) and folded it in half. There you have the base of the card. 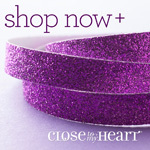 I used Liquid Glass (a Close To My Heart product) on the presents to make them stand out. Then I added some gold "garland" to the top. Now for the Rocking Horse ....I colored it with Distress Markers, added a gold brad on the reigns and also used Liquid Glass on the reigns. 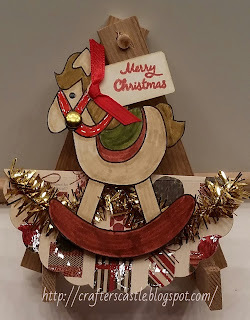 I tied a red ribbon and added that to a tag I had "distressed" with Distress Ink and stamped Merry Christmas and attached it to the rocking horse. 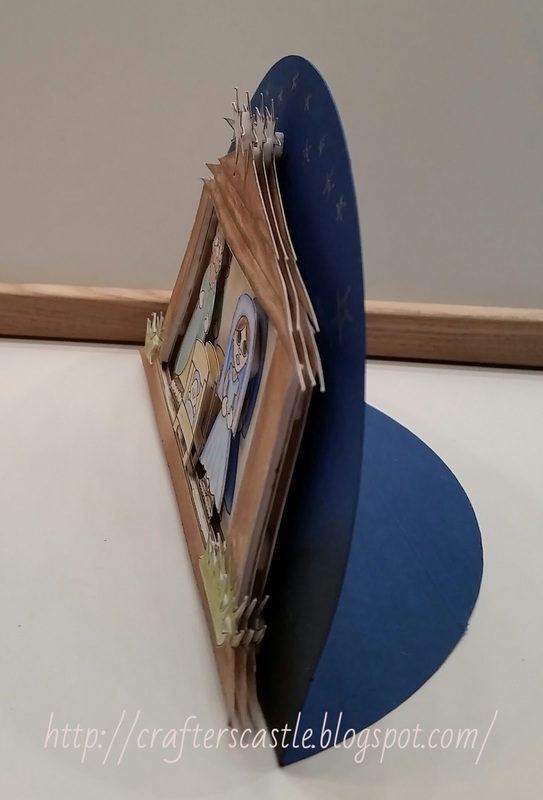 And lastly, I used foam tape to attach the rocking horse to the rocking card. 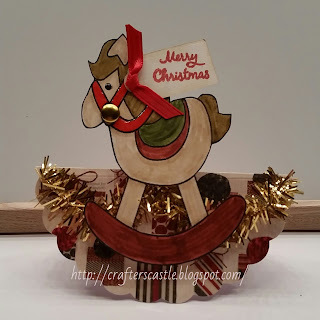 It's really fun because the card makes the rocking horse rock!. 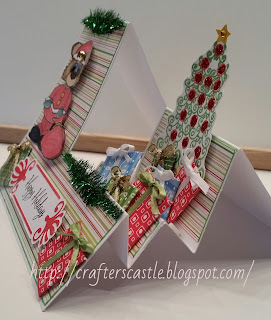 Sisterhood of Crafters - "It's Beginning To Look A Lot Like Christmas"
I love Side Step cards....they are easy to make and look awesome. Below is a YouTube video tutorial I made on how to make a Side Step card and links to the Sunsational Stamps images I used for the Christmas card I made. 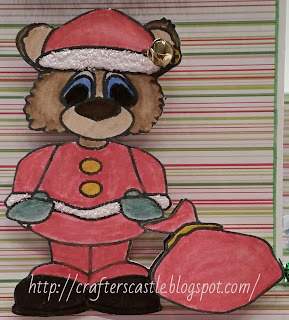 The Sunsational Stamps images I used are Santa Bear (pictured above) that I colored with watercolor pencils, and Flourish Christmas Tree that I colored with glitter gel pens and Stickles. On the Santa hat I added a tiny jingle bell, and I added a tiny gold rhinestone to the star on the Christmas tree. I have a video on YouTube from about 4 months ago titled "My Favorite Besties Holiday Hop" that shows how I made the presents. 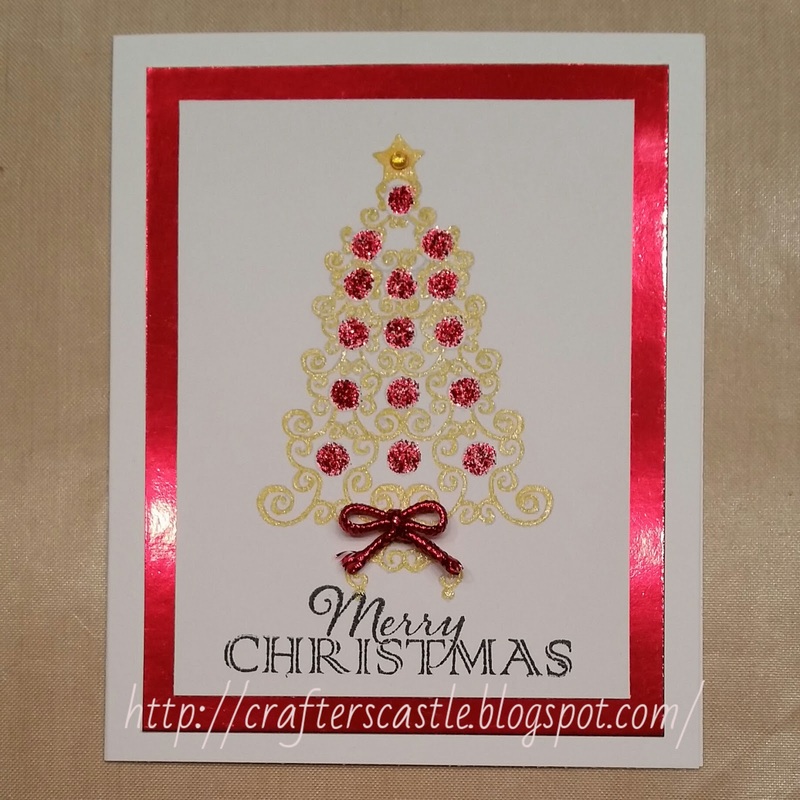 I love Christmas and making Christmas cards! 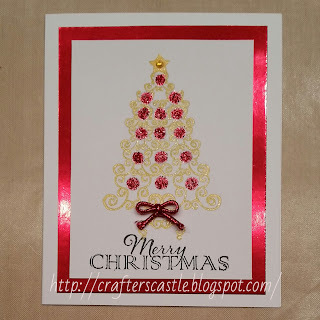 When I saw this Flourish Christmas Tree stamp at Sunsational Stamps I knew it had potential for elegance. I was inspired to create this simple yet elegant card. I stamped the image with a light silver gray ink so that it wouldn't show through the gold glitter gel pen that I used to trace over the image...but if I had a sparkly gold ink pad I would have used that instead. 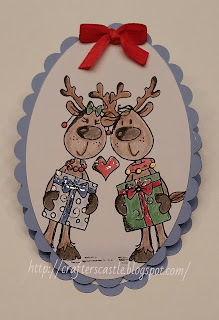 I matted the image on a shiny metallic red cardstock to accentuate the ornaments that I colored with Christmas Red Stickles which also give the ornaments a little dimension and sparkle. I added a gold rhinestone to the star at the top of the tree to make it shine. At the base of the tree I added a bow made from a red metallic cord. 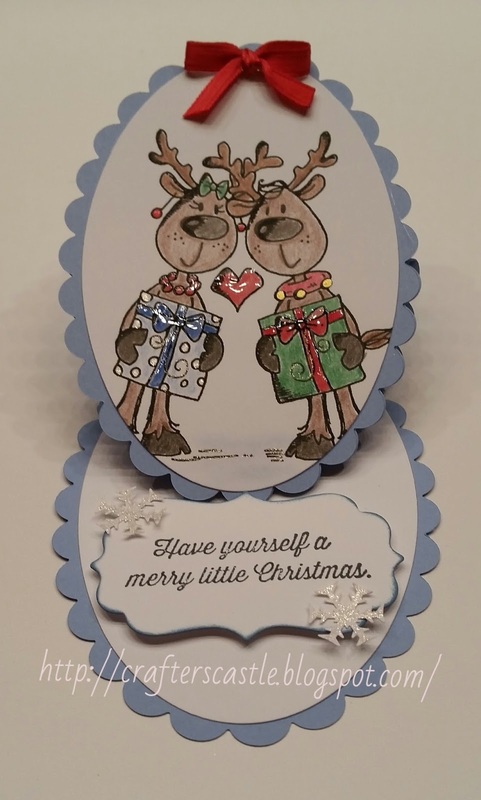 The "Merry Christmas" stamp is from the Christmas Greetings stamp set from Hot Off The Press. 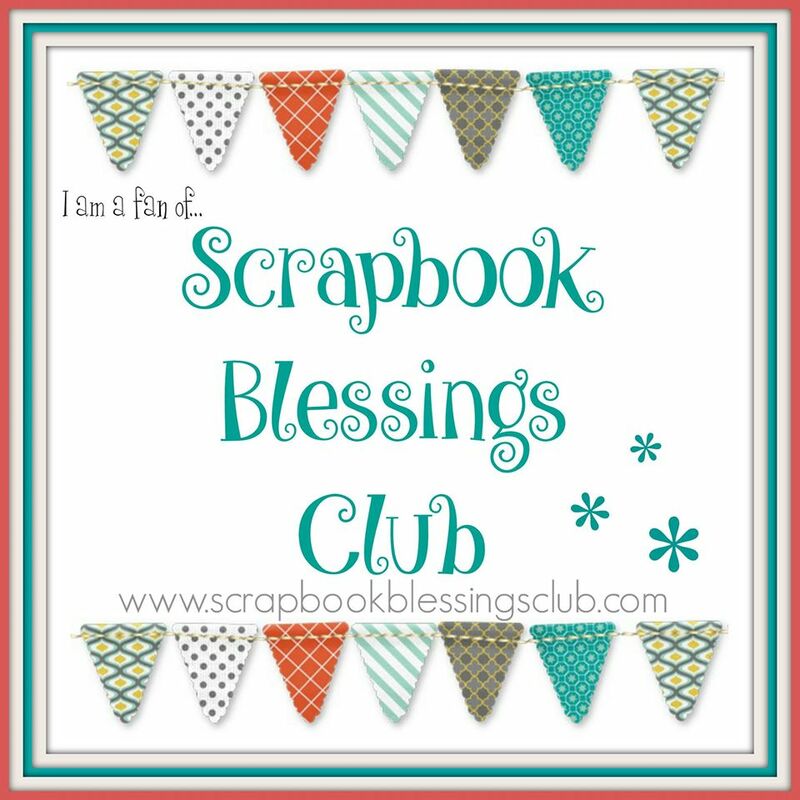 Great Impressions - November Challenge "Bling On The Holidays"
At Scrapbook Blessings Club our November's Monthly Challenge is "Anything Goes: using green, red, and white colors". I was totally thrilled when I found out the sponsor is Bugaboo Stamps because I'm a big fan! I made two cards to showcase their images. 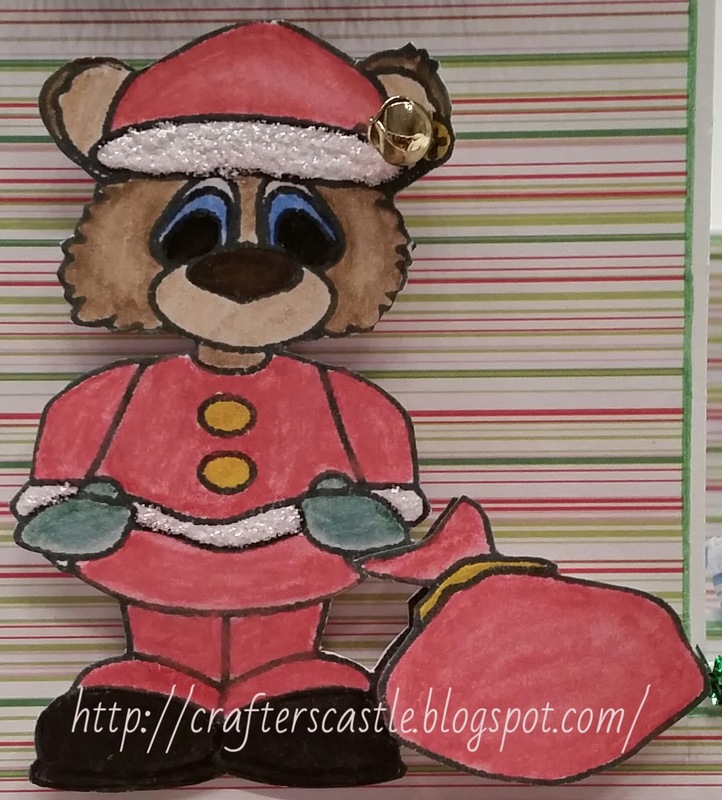 For the first card I used this adorable image called Ornaments Bear and actually created an "ornament" to display it in. 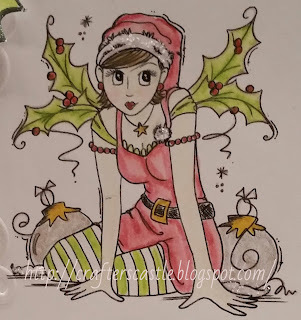 I colored it with watercolor pencils, and Sakura Stardust Gelly Roll pens. 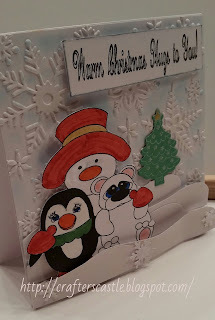 The card is embossed using a snowflake embossing folder, and I added a few snowflakes on the "ornament". The second card I made using Fairy Christmas . I think she is just beautiful and love that her wings are made of Holly. I also colored her with watercolor pencils, and Sakura Stardust Gelly Roll pens. The "fur" on her hat was accented with Stickles "Frosted Lace". 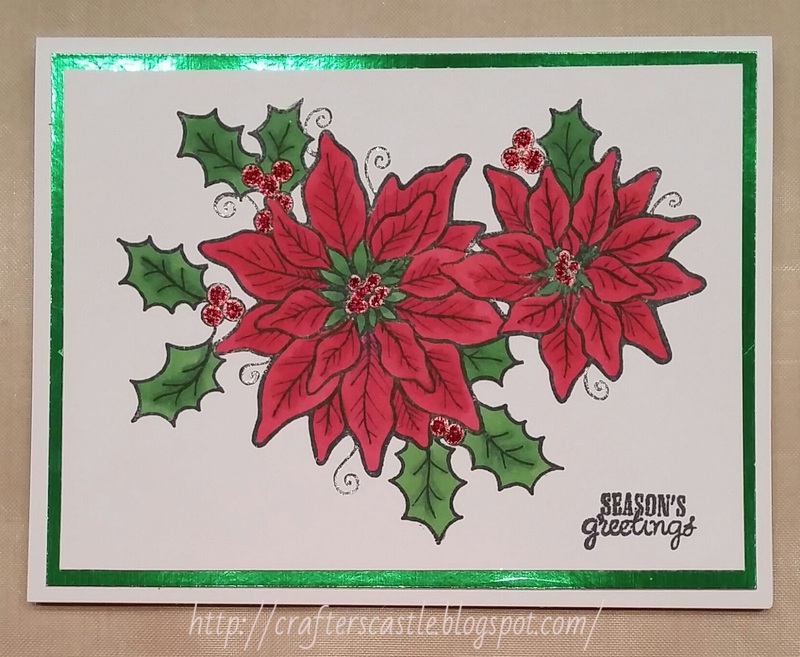 The added Holly leaves are from Paper Sweeties Holly Days Bundle stamps and dies set. The card was embossed with an embossing folder and the raised part was painted over with Smooch pearlized top coat. 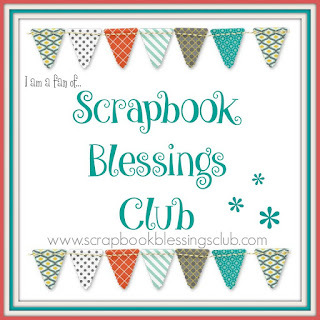 Be sure to stop by Scrapbook Blessings Club and check out the November challenge and great tutorials.